ICFAI distance learning MBA 2017 is specially designed for professionals who wants to get their MBA degree without joining any regular classes. 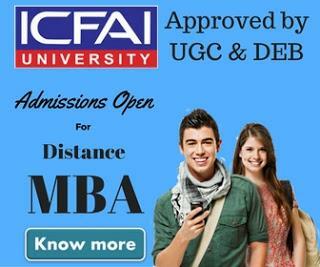 ICFAI is offering a broad-based MBA Program at an affordable fee structure designed to provide a good understanding to their students in different aspects of management.The University is empowered by UGC & DEB to award degrees & also a member of the Association of Indian Universities, New Delhi and the Federation of Universities, India. ICFAI Distance Learning MBA 2017 The two years MBA program has 20 subjects divided into four modules of 5 subjects each. For each year, two modules can be studied and completed. The third module of the program consists of Electives. The student has to select one elective from the following. Marketing Finance Strategic Finance Risk Management HRM Operations Global Markets Healthcare Management IT & Systems International Business Investment Management Hospital Administration Pharma Management Retail Management Telecom Management Innovation Management Side Note: Some subjects as marked in the elective streams are compulsory. The program is based on self-study and examinations. Self-study: The University provides prescribed books and a detailed study plan specially designed for the programs and meant for self-study. Examinations: Convenient Examination schedule.